Amanda Hayhurst saw the flyer that would change her life — and save the life of another — as she and her younger son waited for her eldest son to finish taekwondo class. 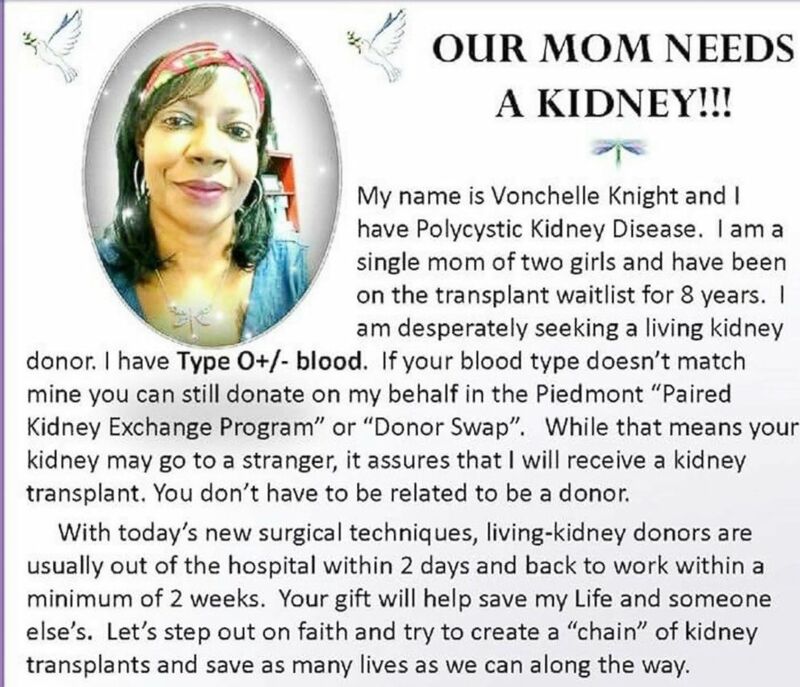 The flyer told the story of Vonchelle Knight, a 50-year-old single mother of two, who had been searching for a kidney donor for eight years. One of Knight’s daughters, Courtney Knight, 29, worked at the studio and posted the flyer for her mom. The flyer for Vonchelle Knight that caught Amanda Hayhurst’s eye is pictured. Amanda Hayhurst, of Beaufort, Georgia, poses with her sons Reese, 1, and Jett, 9. 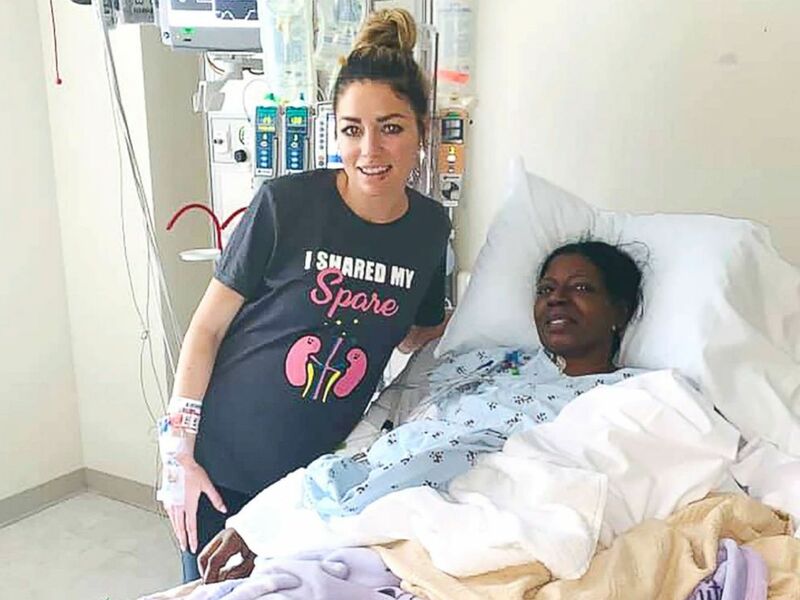 Hayhurst underwent extensive testing over the next few weeks to see if her kidney would work for Knight, a stranger who she still had not met. Doctors determined in December, nearly two months after Hayhurst first saw the flyer, that the two both had type O blood — they were a perfect match. 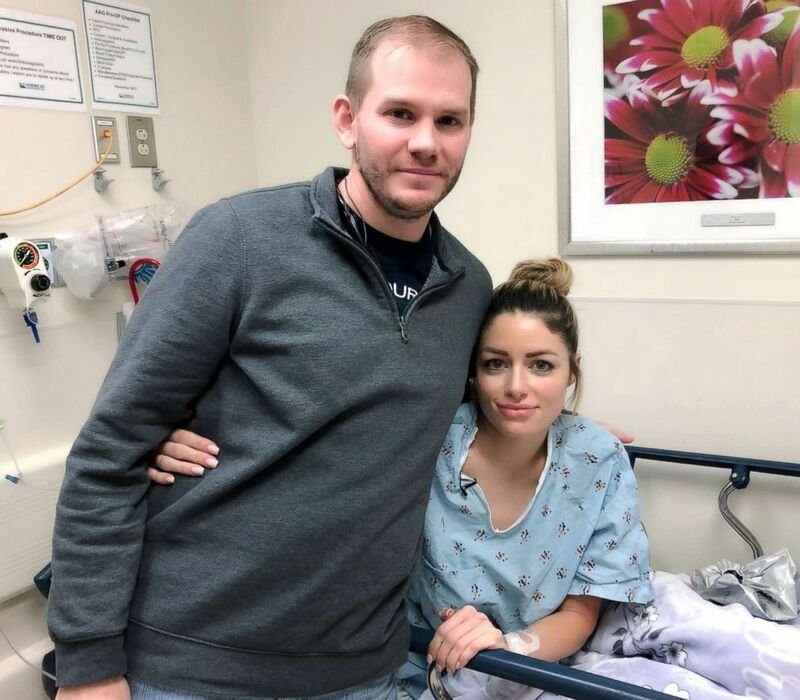 Amanda Hayhurst, 32, poses with her husband, Marcus, before surgery. 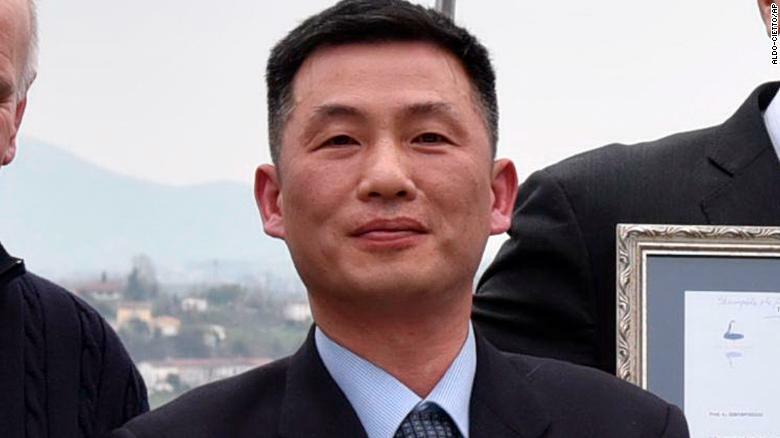 Hayhurst returned to the Taekwondo studio to tell Knight’s daughter about the news first. Then, the pair went to Knight’s house and surprised her upon her arrival from work. Knight was diagnosed with polycystic kidney disease in 2004. She was put on dialysis in 2013, and spent nine hours hooked up to the machine, which she often used while she slept. She was unable to travel and often experienced fatigue and cramps. 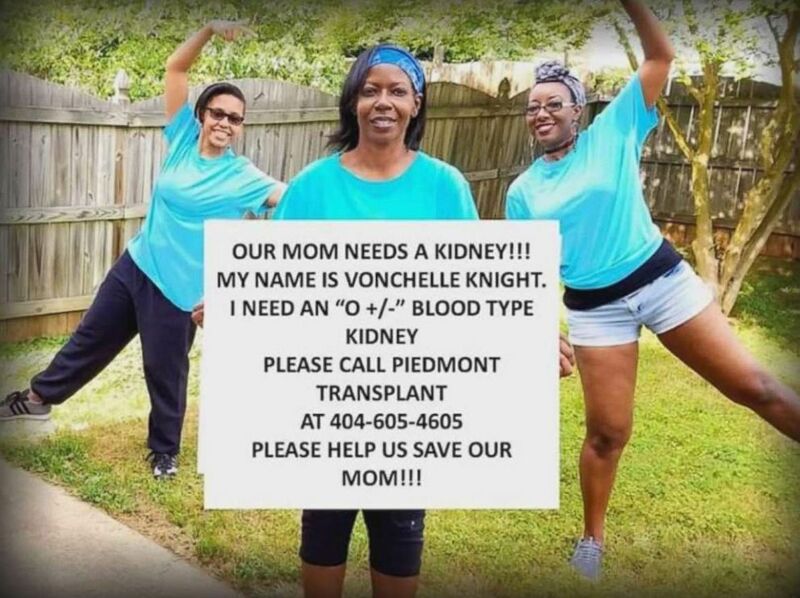 Vonchelle Knight, of Georgia, and her two daughters pose for a photo during her search for a kidney donor. All of that changed on Jan. 25, when Knight and Hayhurst underwent a successful kidney transplant at Atlanta’s Piedmont Hospital. Hayhurst was released from the hospital the day after the surgery. Amanda Hayhurst, 32, left, poses with Vonchelle Knight, 50, after their transplant. Knight said she is recovering well and expects to be released from the hospital in the next few days. The two women who were once strangers now talk every day; their families even spent Christmas together. Hayhurst’s employer has also said it will provide meals for Knight and her family for the next three months. 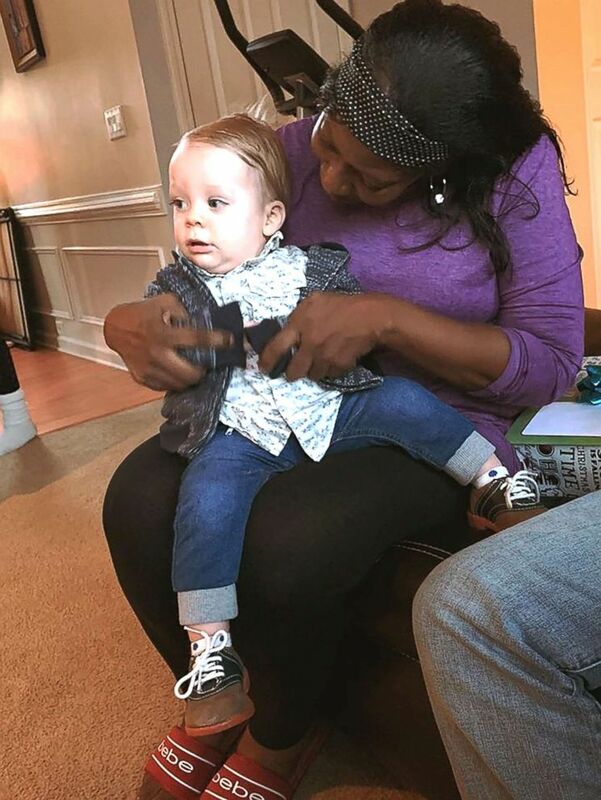 Vonchelle Knight holds Reese, the youngest son of Amanda Hayhurst. Hayhurst has also become an advocate for kidney donations, using Facebook to help connect donors and recipients. Hayhurst and Knight both said they are already planning a vacation together to celebrate Knight’s new life.